Bidspirit auction | WITSIUS, HERMANN. 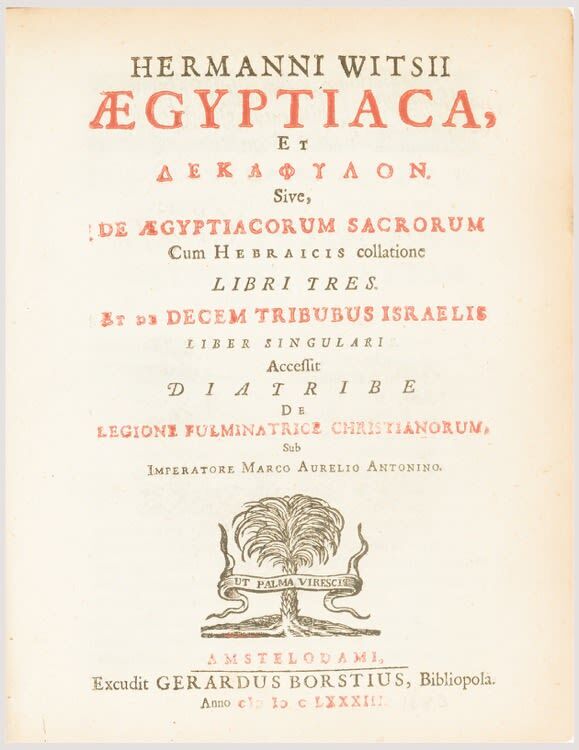 Aegyptiaca et Dekaphylon, sive, De Aegyptiacorum Sacrorum… et De Decem Tribubus Israelie. First Edition. pp. (14), 492. Lightly browned. Contemporary vellum, worn. 4to. A study of Ancient Egyptian religion in comparison with the religious rites of the Jews. Witsius (1636-1708) was a Dutch theologian who spent much effort seeking to bridge the gap between the reigning Orthodoxy of his time and Covenant Theology.